…he gives you his bacon. My friends, it doesn’t get much better than that. He’s still cavorting around the mountains for a little while, so I’m here baking myself my 107% favorite quiche. The crust is baked with pancetta and will give you superpowers. Like the ability to finish off an entire 9-inch quiche by yourself. Fry pancetta in a pan until fat is rendered. In a large mixing bowl, cut butter into the flour using a pastry blender (or however you like to do it). Add pancetta (with all the rendered fat!) to the mixture and toss with a fork. Add one or two tbsp of cold water and toss again with a fork, until dough comes together. Shape into a disk and wrap with plastic wrap, and let chill in the fridge for at least 30 minutes. 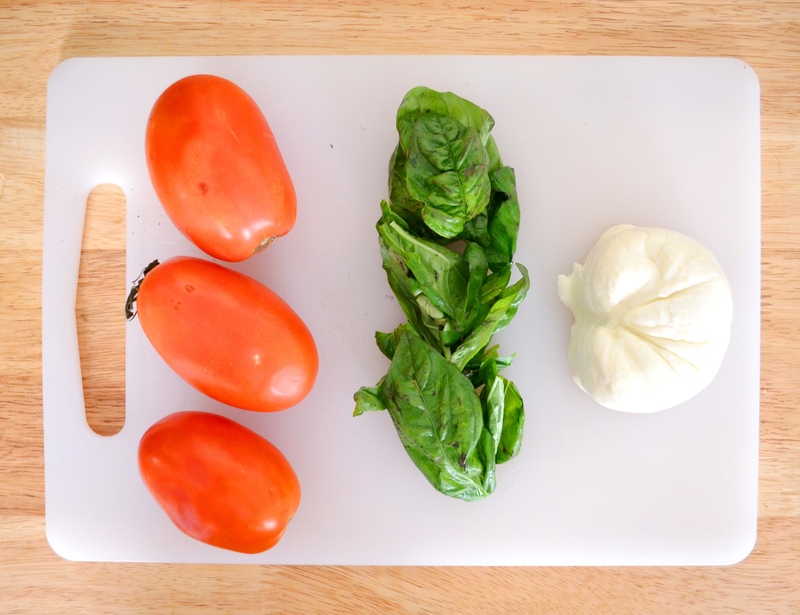 Chop basil and mozzarella into 1/2-inch pieces. Slice the ends off the tomatoes and squeeze the seeds out (this will lower the moisture content of the tomatoes and keep the quiche from getting too soggy). Then chop two of the tomatoes into 1/2-inch pieces and toss with basil and cheese. Slice the remaining tomato thinly and set aside. Take the dough and place between two sheets of parchment paper. Roll it out to 10 inches across, then remove the top piece of parchment paper. Place a 9-inch pie plate lip-down on the crust, then flip the two together so the crust is resting in the dish. Remove the second piece of parchment, and press the crust into the bottom and sides of the dish. You can crimp the edges or just tuck the overhanging edge underneath itself. Poke the crust with a fork a few times and bake in the oven for 10 minutes. Remove crust from the oven and pour the basil, cheese, and tomatoes into it, making sure to distribute everything evenly. 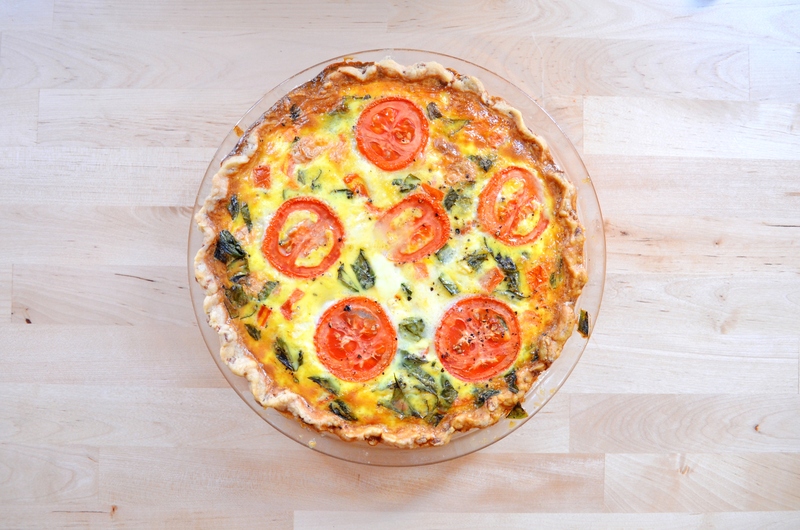 Mix eggs and milk together and add a healthy pinch of salt and pepper, then pour over the quiche filling. Top with the remaining tomato slices and an extra sprinkle of black pepper. Bake for 60-70 minutes, or until the center of the quiche is set (I usually test by tapping it with a wooden spoon — as long as it isn’t wet/oozy, it’s done). Remove from the oven and let cool slightly before slicing. I’m adding in some garlic salt here! that’s an excellent life philosophy if i’ve ever heard one.